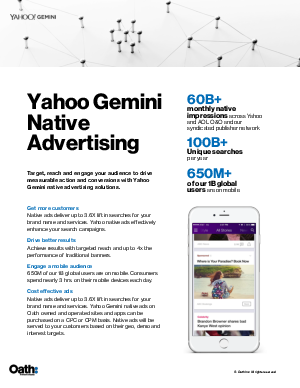 Target, reach and engage your audience to drive measurable action and conversions with Yahoo Gemini native advertising solutions. Native ads deliver up to 3.6X lift in searches for your brand name and services. Yahoo native ads effectively enhance your search campaigns. Achieve results with targeted reach and up to 4x the performance of traditional banners. 650M of our 1B global users are on mobile. Consumers spend nearly 3 hrs. on their mobile devices each day. Native ads deliver up to 3.6X lift in searches for your brand name and services. Yahoo Gemini native ads on Oath owned and operated sites and apps can be purchased on a CPC or CPM basis. Native ads will be served to your customers based on their geo, demo and interest targets.